Something is wrong if you see lawn mower is blowing smoke – but relax. It probably isn't serious. If there is blue or white smoke, it's an indication that oil is being burnt along with the fuel. It may have gotten into the crankcase or onto the engine for a number of simple reasons. When you see black smoke, it usually means the mower has too much fuel and not enough air. 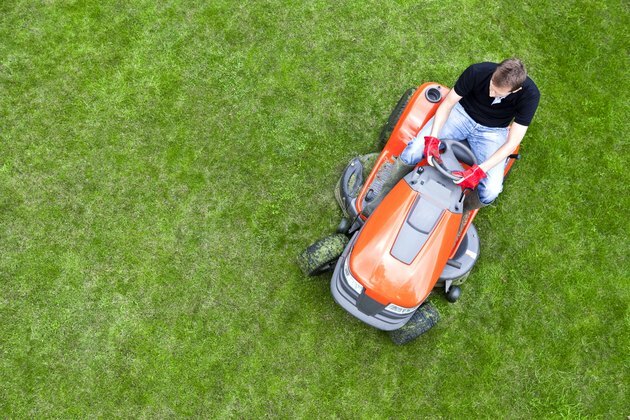 Lawn mower smoke usually doesn't indicate a serious problem, but if it doesn't go away on its own – or it's accompanied by an engine malfunction – you may need a lawn mower repair. Why Is My Lawn Blower Blowing Smoke? A lawn mower engine will puff out black smoke when the fuel and air mixture is too rich. Because there isn't enough air, combustion is incomplete, and the unburnt fuel in the combustion chamber turns to smoke. You see the same phenomenon when you burn leaves and pack them too tightly to allow air to circulate. The most common cause of black smoke in a lawn mower is a dirty air filter, and that's easy to fix. Just remove the filter and clean it with soap and water, or replace it with a new one. If there is still lawn mower smoke, you may have to adjust the carburetor to make a leaner fuel mixture. This is usually just a matter of turning a screw, but you'll have to consult the owner's manual for your lawn mower to find which one. It can be disturbing to see a cloud of white smoke coming from your lawn mower. But if you let it run, the lawn mower smoke will usually stop. It's a sign that the engine is burning oil, but the oil probably got in there for an innocuous reason. You may have spilled some on the housing when you serviced the mower, or you may have overfilled the crankcase. It's also possible that oil got into the combustion chamber when you turned the mower over to clean the blades. Even mowing on a hill can cause oil to spill into the combustion chamber. If you're using a two-stroke mower, you may have added too much oil to the gas. The normal proportion is usually between 50 to 1 and 40 to 1. The excess oil won't hurt the engine, but if you want the smoke to stop, you'll have to change the fuel. Sometimes a new mower will emit white smoke when you start it for the first time. That's usually the result of oil residues left by the manufacturer. You don't need a lawn mower repair – just let the mower run. The engine will burn off the residue and the smoke should stop. An excess of blue or white smoke could mean that oil has a pathway into the combustion chamber through worn seals. If this is what's happening, the mower won't stop smoking, and the engine may sputter or stop. The cause could be a rupture in the breathing tube, which channels air from the combustion chamber to the exhaust port. It could also be a blown head gasket, which will soak the air filter with oil. Unless you happen to be a small engine mechanic, these problems need a professional lawn mower repair.